At Village Square Chiropractic we are thrilled for Chiropractors with Compassion because we are committed to transforming families’ lives both here in Ottawa and around the world. As partners with Compassion Canada, we are raising money to release children around the world from poverty. Our office donates $20 from every new patient examination fee to fund child-centered projects in many countries around the world. At Chiropractors with Compassion, we are on the “March to a Million!” That right! We are currently funding our 8th project which is the installation of a vocational training and income/employment generating centre which will empower women to stop depending on the garbage dump to meet their families’ daily needs. This project will also provide a playground and day care-type facility where children can play safely, new classrooms, education through literacy classes and clean water for the community. 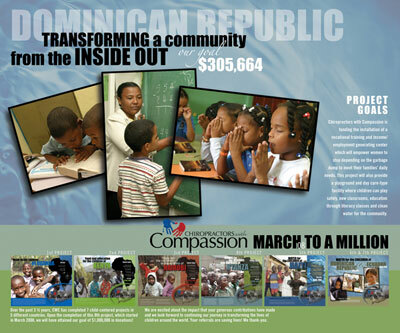 We expect that before 2008 is done we will have raised $1 MILLION for Compassion! Can you tell we’re excited? 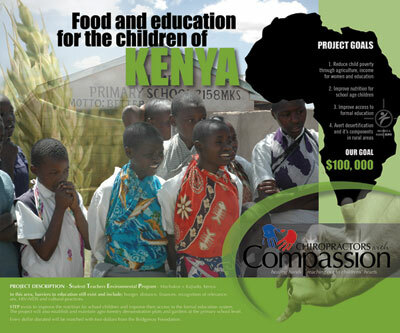 This project has been our most ambitious to date, in fact, its the largest Partner project that Compassion has undertaken. What Chiropractors with Compassion has done in the Dominican Republic is fund the installation of a vocational training and income/employment generating centre which will empower women to stop depending on the garbage dump to meet their families’ daily needs. This project is also supplying a playground and day care-type centre where kids can play freely, safely and be educated. This project also supplies water for the entire community. This project is transforming this entire group of people from the INSIDE OUT. Our sixth and seventh projects were a combined effort where we focused on providing families with safe and sustainable water supplies. These projects served families in both the Dominican Republic and Ecuador. The project did exactly what it set out to do and gave proper water access to over 5000 children. Proper water supply is one of the most life-saving efforts that any organization can provide. Water not only provides a sustainable living environment, it creates a safe place for children and families to live and grow up in. One of the greatest aspects of this project is that we completed it in December of 2007 … in record time! Our fifth project was completed in December 2007. The families that were blessed by the project received a safe and sustainable water supply. Also, proper hygiene practices were taught to the children so that infection due to poor sanitation standards would be eliminated. Can you imagine not having a proper water supply for you and your family? Many of the diseases and infections that we face here in North America are related primary to our lifestyle choices. We consume toxic food, toxic medications, live sedentary lifestyles, and often live with toxic emotions and thought patterns. The greatest challenge that most of the people in these countries face is basic sanitation and refrigeration. We may have different primary struggles, but we all need to learn from each other and help each other grow. By providing Partnership with Chiropractors with Compassion and by visiting these projects, we are growing as a team here at Village Square Chiropractic and learning about our own growth and development! Nyanza province in Kenya. The children are sick from poor nutrition and the deplorable conditions they live in. 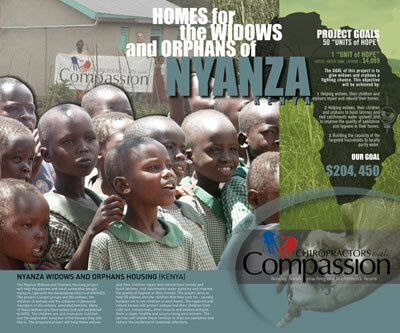 The project will help these widows, and the children they care for, repair and re-build their homes. The project will build exactly 50 homes – usually between 6 to 10 children live in each home. The homes will protect widows and children from rain, mosquitoes, other insects and snakes. It will give them a clean, healthy and secure living environment. Latrines will enable these families to improve sanitation and reduce the incidence of intestinal infections. 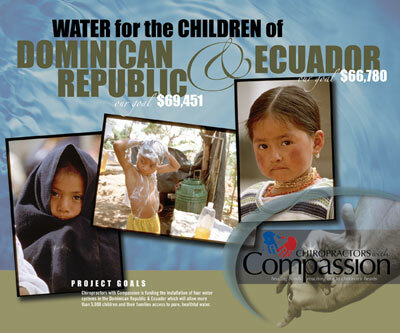 The third Chiropractors with Compassion project was completed in November 2006. The project takes place in the Mathare Valley, Nairobi, Kenya. In the Mathare slum, more than 600,000 people live in desperate destitution and squalor. Families are crowded together in one-room mud or cardboard shacks, roofed with assorted pieces of corrugated tin, cardboard, or grass. Unemployment is endemic. Because of poor sanitation, outbreaks of typhoid and other diseases are common. Most families have no stable income, and children receive no schooling. Many live on the streets, and as many as 60% of the children resort to thievery, prostitution, begging, or scavenging in order to survive. Since 1997, the Mathare Street Children Rescue Centre has been ministering to the physical and spiritual needs of the children and families who live in the slums of Nairobi. Church workers and volunteers dispense food, education, health care, and family support to slum children. Primary school education for 399 children. Education and meals for 750 children. Family support, when appropriate, to empower parents to care more effectively for their children. 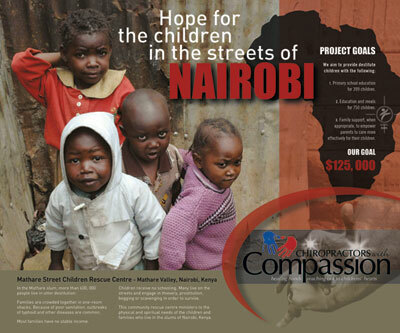 The Chiropractors with Compassion goal for the Mathare project was $125,000. The second Chiropractors with Compassion project has recently been completed. STEP, or Student Teacher Environmental Program, took place in the Machakos and Kajiado districts of Kenya. In this area of Kenya, barriers to education still exist and include: hunger, distance, finances, recognition of relevance, gender, HIV/AIDS, and cultural practices such as early marriage and pregnancy. STEP exists to improve nutrition for school children and improve their access to the formal education system. The project will also establish and maintain agro-forestry demonstration plots and gardens at the primary school level. 42 teachers in 12 schools will be trained to participate in STEP. The cost of the project was $499, 800 (CDN), and the Chiropractors with Compassion goal was $100,000. Every dollar raised was matched 2:1 by the Bridgeway Foundation. A cheque for $100,000 was presented to Compassion Canada on Saturday, November 12, 2005 at the Warrior Coaching Leadership Summit 2 in Toronto, Ontario. Villagers in Kisoro cannot dig or install latrines because of the hard, volcanic soil. They must collect water from drainage ditches shared by animals. Twice a day, children as young as 6 or 7, many of them AIDS orphans, travel several kilometres through mosquito-infested swamps in order to collect water. The children miss school hours and put themselves at risk of catching malaria to collect the polluted water. By equipping the town with preformed water storage tanks provided by a local manufacturer, Water for the Children aims to harvest rainwater and provide a safe water supply for the community. The cost of the Kisoro Water for the Children project was $61, 875 (CDN). This goal was reached in February, 2005, through the help of chiropractors across Canada who have joined to help fund Chiropractors with Compassion.